Thanks, that was helpful! 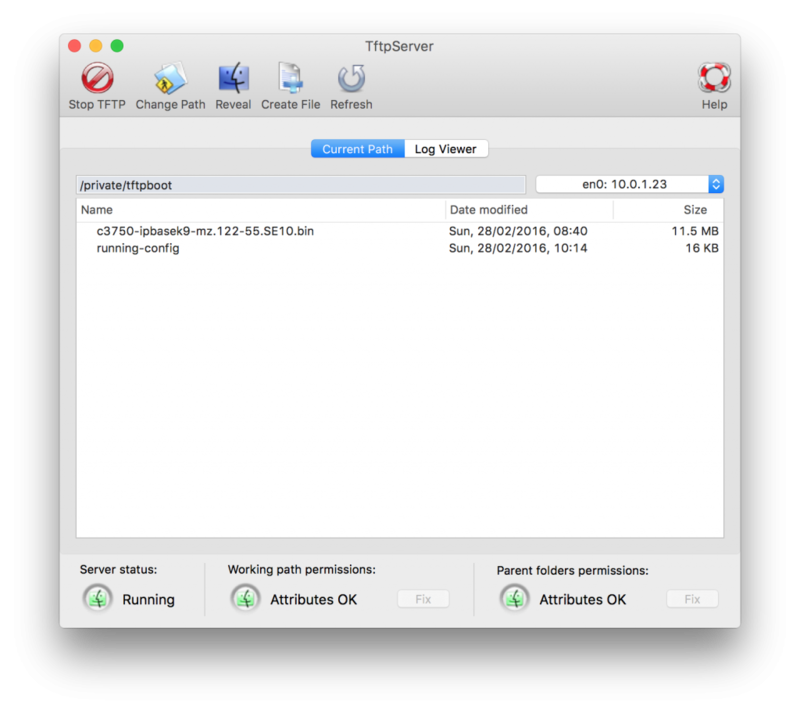 Obviously TFTP Tool does not let me change the working path on El Capitan. That’s ok, but unexpected 😉 Works fine now! THANK YOU. I’d been fighting with PXE all day and with your instructions, I got it working. Thank you for taking time to write this post. I actually was running the TFTP Gui and it stopped working after updating to El Capitan. Running these two commands below helped me. Nice post. It did what I needed it to do. Do I just reboot or is there anything to do to shut down the tftp server? I’ve tried three different tftp servers, and the problem I have on both my machines is that port 69 still shows closed. tcpdump shows the incoming tftp requests, and the filename, but that’s it. That bangs away for a minute, then the tftp on the other end (cisco switch) times out. Any ideas? Firewall is off. Click on start TFTP does not start the TFTP server. Anything I am missing? Folder rights properly set. I see Green colour for both working folder and parent folder permissions. @Prem: Did you ever get this working? I have the same problem. $ dnsmasq -d –enable-tftp –tftp-root=. Although English is not my mother tongue, I was born in the German speaking area, but as far as I understand I have to go with Mac OS X El Capitan, with Server Connect, sounds very promising. But I will follow this tutorial point by point exactly with TFTP server, in case of problems with the installation I will log in here. Apr 12 11:22:05 xiaoxiliudeMacBook-Pro TftpServer: objc: Class FIFinderSyncExtensionHost is implemented in both /System/Library/PrivateFrameworks/FinderKit.framework/Versions/A/FinderKit (0x7fff8eaf9c90) and /System/Library/PrivateFrameworks/FileProvider.framework/OverrideBundles/FinderSyncCollaborationFileProviderOverride.bundle/Contents/MacOS/FinderSyncCollaborationFileProviderOverride (0x114ba5cd8). One of the two will be used. Which one is undefined. HI I have been struggling this issue. My TfgpServer gui shows server status as “Stopped” while Attirbutes OK shows all green. Any advice? I have same issue as Networry. Can someone please share the solution to fix?